The Chat tool in Canvas allows students and teachers to interact in real time. The Chat tool must be enabled for your institution before it can be used in Canvas courses. If you are an admin, contact your Customer Success Manager for assistance. Chat is not available when masquerading. Chat is a course tool that is available to all students in the course. Chats cannot be limited to specific students. 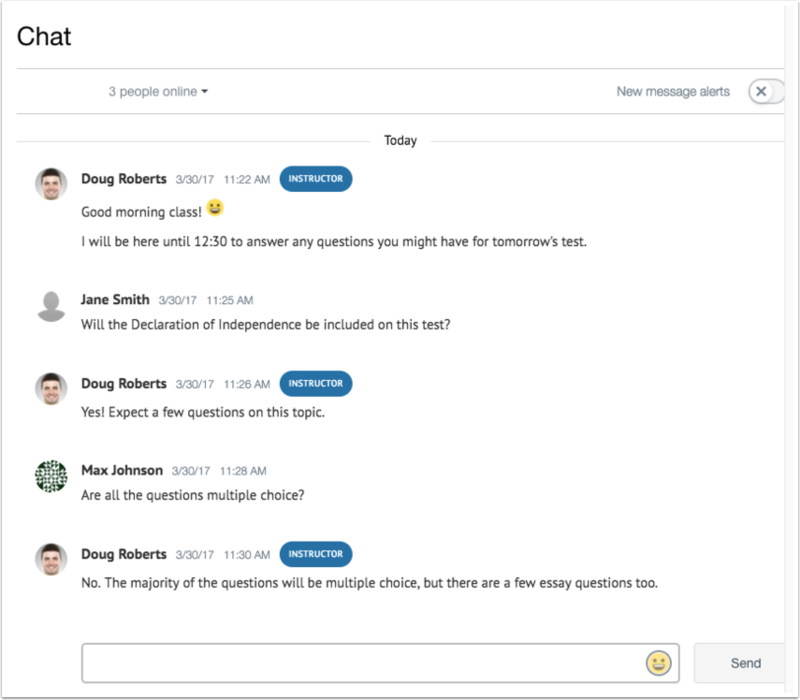 Instructors can use the chat tool to allow students to contact them when online, create virtual office hours, conduct group discussions or study sessions. All users in the course can also access the chat history. Note: Students cannot delete chat comments. Previous Topic:What is the Calendar? Table of Contents > Canvas Features > What is Chat? Re: Chat Tool Number of Participants in a Session?